The angel’s song of “Peace on Earth” seems so far off right now, doesn’t it? Still, it remains our prayer. May the peace of Our Lord be with you and those you love, this season and always. We realize that there are many sudden needs on this earth, and we thank you sincerely for remembering the needs of our mission, which continue day to day. We never tire of saying it: you are the strength of our mission. It is you who keeps our signal vital and strong. May God immensely bless you for your kindness. And may you enjoy a Blessed and Merry Christmas! OUR BIGGEST STAR: (left) Viewed from several blocks away, the KNOM Christmas Star proclaims Christ’s birth from 85 feet above Nome. Former KNOM engineer Timothy Cochran built the 5-foot frame, and he built it to last, as winds at that height regularly exceed 100 MPH. It was remodeled by Les Brown in 1997. The star is streamlined, made of lengths of electrical conduit and lit by strings of halogen lamps enclosed in tubes of plastic, the same type of lights used by casinos in Las Vegas. A local donor who wishes to remain anonymous contributes the cost of its electricity and repair. 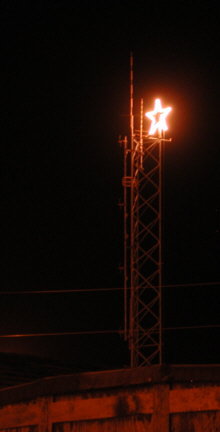 In 1971, volunteers John Pfeifer and Tom Busch constructed the original star of wood. That year, gale force winds destroyed most of the bulbs by the end of December, and blew the star into pieces before they could climb the tower and rescue it. Winds destroyed the next three stars, before Timothy came up with the current sturdy design in 1995. PLAYING AROUND: The weeks before Christmas, KNOM broadcasts a seasonal play every day, produced by KNOM volunteers throughout the years. The stories include entertaining KNOM versions of “The Velveteen Rabbit,” “The Fourth Wise Man” and Dickens’ “A Christmas Carole,” as well as many original plays. Several of the productions have won awards over the years. As Christmas approaches, we gradually add Christmas inspirational spots and music. By December 18th, the days are filled with hymns and carols. We think of it as decorating our air signal, just as one decorates a tree in honor of Our Lord’s birth. SNOW BUSINESS: Early winter in Nome was unusually dry this year, with only a few flakes of snow at sea level. By mid-November, the snow line had only descended to the 2,000-foot level of surrounding hills. The dry weather was caused by a “Siberian” high pressure cell which settled over the region, pouring cold air from the high arctic. Temperatures generally held between about -5° and +10°. ADVENT INSPIRATIONAL SPOT: During Advent, the church reflects on Mary and her anticipation of the birth of Jesus. The words of the Magnificat recorded in Luke’s gospel are not those of a submissive woman. They come from a woman of integrity, insight and compassion. A woman who knows and trusts God. top REPEAT, PLEASE? At press time, Les Brown and Tom Busch were scheduled to fly to the village of Shishmaref (SHISH-mah-reff) to prepare for a KNOM repeater there. As we reported last month, the FCC is willing to lift their freeze on repeater applications, as Shishmaref, located on a barrier island, is rapidly losing land to the brutal waters of the Chukchi (CHUCK-chee) Sea. The jury is still out as to whether the FCC will lift the freeze for the village of Kaltag, and we’re still working on an application for higher night-time power. Please stay tuned. As we prepare to celebrate Jesus’ birth, we especially remember the KNOM friends and benefactors who left us to be with the Lord this past year. Please add them and their families to your prayers, won’t you? FRONT ROW SEATS: Live from Anchorage, KNOM brought our remote listeners over 20 hours of coverage of the Alaska Federation of Natives annual conference. News director Paul Korchin produced dozens of interviews with native leaders, and volunteer music director Andrew McDonnell recorded hours of native music performances. 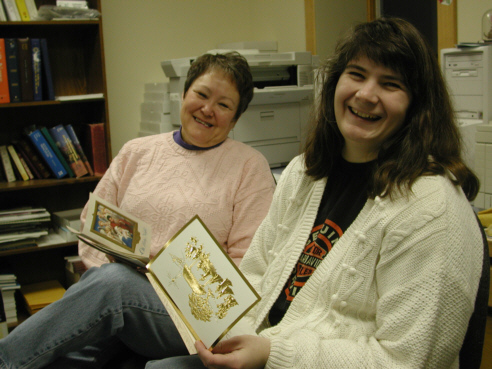 WHAT A CARD (left): KNOM business manager Florence Busch, at left, and development associate Connie Albers open Christmas cards in the upstairs office. The cards are taped to our studio windows to offer the staff some extra cheer. like KNOM to your will. to major improvements and emergency savings. CHRISTMAS INSPIRATIONAL SPOT: Lord, as I put up my Christmas tree, help me to decorate my life, too. For every ornament I hang, let me bring a kindness to someone. For each bright colored light, a smile and a laugh to another. So that my life, as much as my tree, will radiate Your Joy. INSPIRATIONAL SPOT: Along with every Christmas card and every Christmas present, Lord, I will send a special prayer. I will ask that You may be at the very center of their Christmas. And my prayer will get there first! top PLENTY AT “STEAK” (left): Meet KNOM volunteer Tim Bodony. 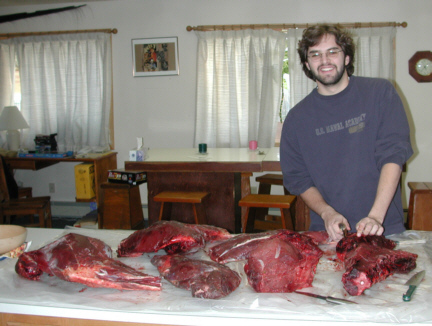 Here, Tim’s helping butcher a caribou donated by a local hunter. Caribou are plentiful this year; the meat is tender and flavorful. 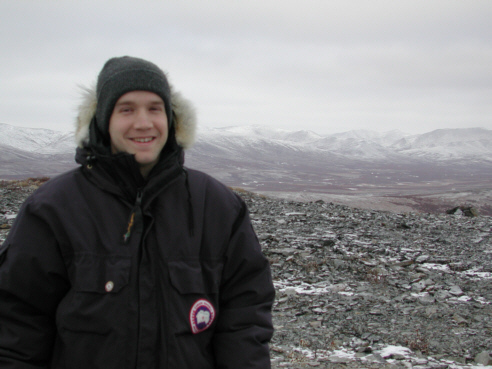 Tim is 23, a 2001 graduate of the University of Notre Dame in Government and Theology. From Glen Ellyn, IL, he serves KNOM as public affairs specialist, deejaying on the air and producing interview programs and news reports. Tim has “taken to baking” since he moved to Nome. He was music critic for the Notre Dame paper and continues to write “never-to-be-published” music reviews just to keep in practice. Sundays, you’ll find him playing guitar at St. Joseph’s parish. Living in isolated Nome, Tim misses playing golf and attending concerts “but I don’t miss traffic and shopping malls,” he laughs. The answer is our physical remoteness. Except for barge shipments from Seattle during the summer, everything must be carried by airplane 539 miles from Anchorage. Due to shipping backlogs, goods can sit on pallets in Anchorage warehouses for as long as two weeks before being shipped. That can lead to spoilage, which drives prices even higher. We use a lot of canned goods, rice and noodles. We do not eat like royalty, but we are getting by. Thank you to everyone for their caring and concern for us. CHRISTMAS INSPIRATIONAL SPOT: Falling snow...Christmas carols...lights glistening... the special sights and sounds of church...It’s the most memorable and nostalgic time of the year. And such an appropriate time to make peace in our families, and among relatives and friends. Are there any old wounds that need healing? God promised peace on earth to those of good will. And He keeps His promises. top THIRTY YEARS AGO: Nome’s power lines were old, and subject to frequent outages in the wind. By December 1971, KNOM had experienced over a dozen power failures, throwing the station off the air, once for as long as 28 hours. The Nome Static began to beg for funds to install emergency generators. Mid-November snow had yet to descend to the top of 1,200-foot Anvil Mountain (left), where KNOM volunteer Andrew McDonnell poses. For his second volunteer year, Andrew deejays evenings, and serves as music director. His quick wit and welcome smile are great assets to the mission. Thank you, Andrew, for a second year! FULL OF HAM: Congratulations to KNOM production manager Mike Nurse, KLØUJ, who passed the grueling test to become an Extra Class Amateur Radio Operator. That’s the highest level. General manager Tom Busch is also an Extra, and news director Paul Korchin, business manager Florence Busch, inspiration director Lynette Schmidt and engineer Les Brown are all Technician Class amateurs. Lots of ham! No comment! THANK YOU AGAIN for your generosity to our work. Once more, may Christmas Day dawn bright and happy for you. God bless you! INSPIRATIONAL SPOT: Let my arms be a manger, Lord. To serve the newborn king. Let my heart be a shepherds’ fold where angels join to sing. Let my life be a traveling ground where Magi seek the Son. And most of all -- let my heart be an open inn to welcome the Holy One. CHRISTMAS INSPIRATIONAL SPOT: Blessed Child upon the hay, please listen to my prayer, for I am a sinner and miles away from Bethlehem. I have no frankincense or gold. The shepherds brought you sheep. I don’t even have a lamb. I have only my heart, Blessed Child, but if You accept it, it will soon glow with love. And as years pass, I know it will become a joy to You. Blessed Child, now grown, listen to my prayer today. For I am a sinner and miles away from Bethlehem.